Welcome to a spin-off thread on Arrigo Sacchi's AC Milan team and innovative 4-4-2 - continuing the theme of using very fluid tactics and a team of technical, intelligent and hard working (aka Complete) footballers to recreate the style of football made famous by the likes of Ajax, Barcelona & Milan and personified by the likes of Rinus Michels, Johan Cruyff, Pep Guardiola and - of course - Arrigo Sacchi. If you haven't read the first thread, please follow the link for Johan Cruyff's 3-4-3 Diamond. 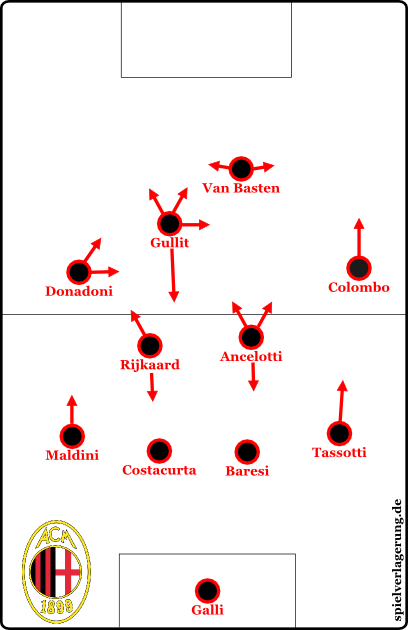 In this thread, I am going to talk about Arrigo Sacchi's 4-4-2 formation employed by his legendary AC Milan team - the last side to successfully defend the European Cup / Champions League & commonly regarded as one of the best club sides of all time. Sacchi's philosophy stems from that of the Total Footballing Dutch teams of the 1970s and is a great example of how you can maintain a similar approach to the game, whilst playing a totally different formation. Understanding this will give you a lot more flexibility and freedom in your approach. I have tried to avoid -"..bla bla.. he was a shoe sales man.. bla, bla.. he's not a horse" - as much as possible and provide content with some insight. It isn't easy If you can recommend any additional resources, please do & we'll have them added! Once again - using the excellent resources at Spielverlung - this is the shape we are trying to create. *I am not sure which game this was taken from but many resources list the wingers on opposite flanks. Inspired by the legendary 'total footballing' Dutch teams of the 1970s, Sacchi followed a lot of the same concepts. Sacchi was also responsible for some innovations of his own. Compactness - Sacchi has been quoted as instructing his players to play no more than 25 meters from defence to attack. When Sacchi took over AC Milan, very negative tactics were common place. Most sides played a back 4 + libero with tight man-to-man marking so Sacchi's decision to play an expansive 4-4-2, press and use a zonal marking system was another reason he is seen as a visionary. Given zonal marking is common these days, that will be less of the discussion but certainly not overlooked. Last time, I talked about formation, shape and mentality as the backbone of my tactic - which is true - however this time I want to discuss shape, mentality and team instructions as the key components of your playing style. 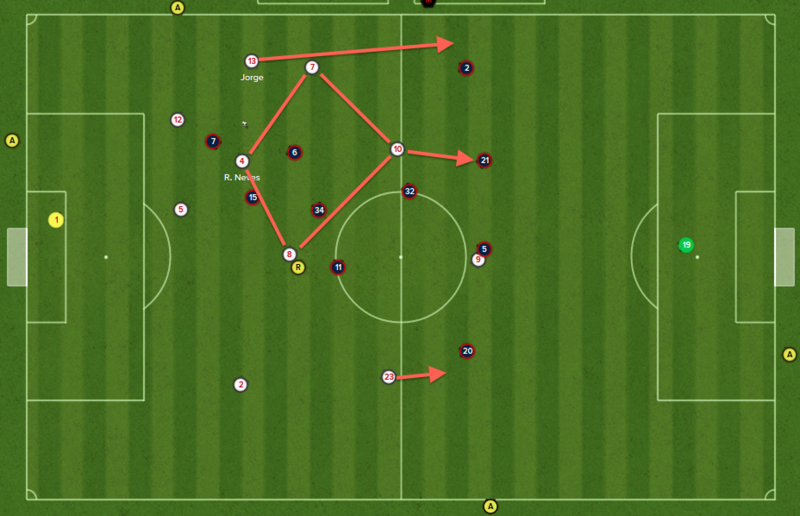 This can also illustrate how you can use the same playing style with any balanced formation. For example, Pep Guardiola has used 4-3-3, 3-4-3, 4-1-4-1, 2-3-4-1 (?) and goodness knows what else but always maintained a similar style of play, which has evolved over time. The same could be said for Simeone with 4-4-2, 4-3-3 and 4-5-1. As you may have guessed from the title, we are going with Very Fluid. This is for 3 primary reasons. Very Fluid gives us the most compact shape possible, by reducing the difference between the mentalities of attacking or defensive players. Very Fluid instructs our whole team to attack and defend as a unit, which - combined with Team Instructions - is excellent for high intensity pressing. 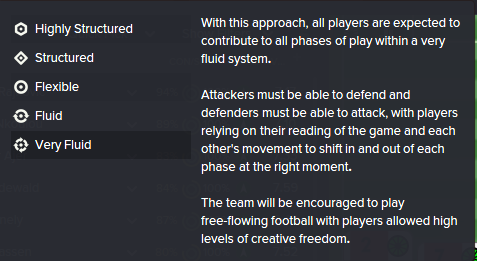 Very Fluid gives the entire team higher creative freedom so my "complete footballers" can make their own decisions. The combination of Very Fluid shape with Standard mentality offers synergy due to it's balance. The entire team attacks and defends as a unit. The downside (if misunderstood) of very fluid is that it effectively magnifies your mentality changes massively. For example, using very fluid + attack means you have 4 David Luiz in your back-line. Using very fluid + defend means your attackers are very risk averse and primarily defend. If understood correctly, tweaking mentality at the correct stage of a game can be a real weapon for you. I think the only difference between this and my Ajax team is the offside trap and not selecting be more expressive, due to slightly less creative players. This style is less of a strategy and more of a template to allow good footballers to play good football. Looking at the YouTube videos and analysis detailed above, you could easily opt for a 4-4-2, 4-4-1-1 or a variant of 4-2-3-1. My interpretation is a 4-4-1-1 illustrated below. Two solid banks of four. A holder and a runner in central midfield. 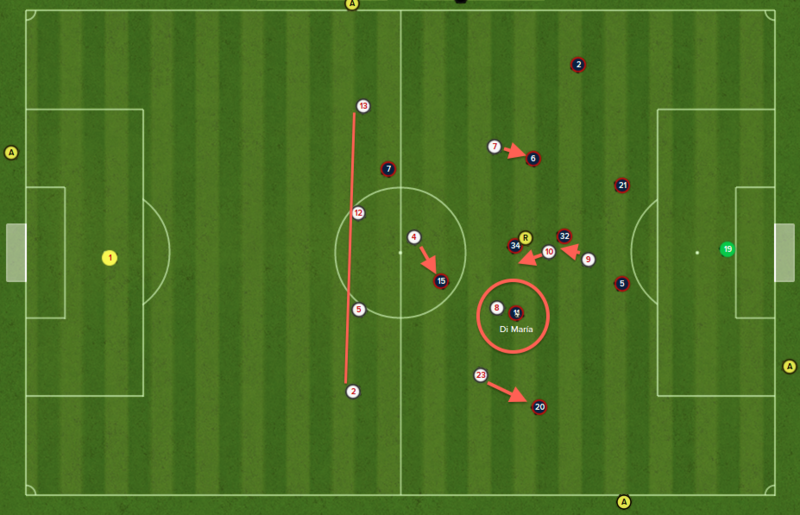 Width on both flanks from the right Wing (Attack) and left Wingback (Attack). The wide midfielder and attacking midfielder both support the central midfielders - at times, creating a diamond shape in possession. Attacking midfielder linking midfield and joining the attack. Spearheaded by a Complete Forward who will move, create space for support runners and attack directly. 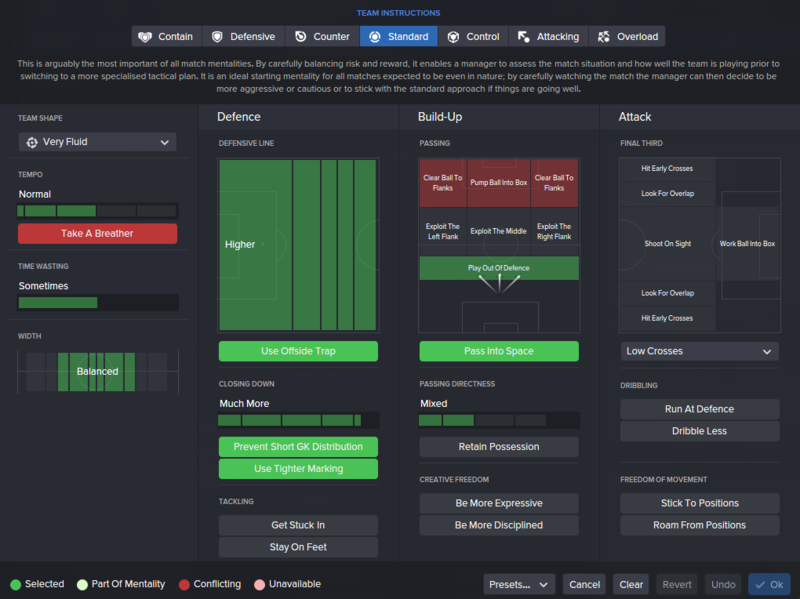 As per wwfan's influential 12 Step Guide on How to Play Football Manager, in order to successfully play a Very Fluid shape I need to limit my team to 0-1 Specialist roles i.e playmakers, ball-winners or anything with a fancy name. Intelligence - Decisions, Vision, Off the Ball, Anticipation, Concentration. Work Ethic: Determination, Work Rate, Stamina. Sacchi's team had an Italian spine and a heavy Dutch influence. As you can see, I have a similar Italian spine but my attacking influence is from Portugal due to the well rounded technical ability, intelligence and work ethic of Ruben Neves, Goncalo Guedes and Bernardo Silva (AMC w/ work rate = 17). This squad wasn't cheap, or easy to assemble but I am very happy with it. You join me in the 2018 Champions League Final, preparing to face Paris Saint-Germain. After PSG won the Champions League in 2016 and took advantage of their hefty budget they boast a very strong squad. 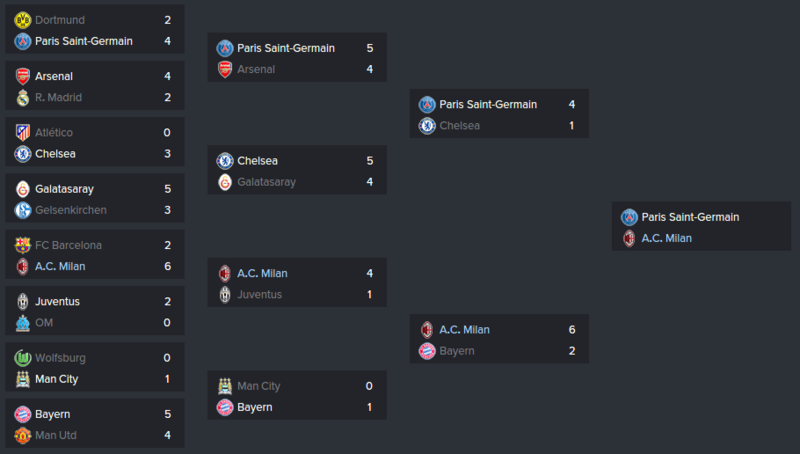 On the way to the final, PSG defeated Dortmund along with English super-money clubs, Arsenal and Chelsea whilst Milan have faced an aging Barcelona, Juventus and Bayern Munich. PSG are lining up in a very narrow 4-1-3-1-1 with a superstar midfield. It'll be interesting to see how the compactness of our playing style helps the two man central midfield against five, excellent opponents. Mauri immediately closing down & putting him under pressure. Neves drops deep, creating a solid triangle with the Rugani & Romagnoli and gets close to opposition AMC. Locatelli comes inside to press the opposition MCR. Silva presses the opposition MC and cuts off DMC. Guides covers the left fullback. The objective here is to not necessarily win the ball immediately - although that is ideal - most of the time you'll pressure the opposition into a speculative long pass, easy for our defence / midfield to intercept. Silva, Berardi, Neves and Mauri really crowding their space. Solid two banks of four. Jorge is supported by Neves, who can cover his position and is cutting out a pass. This is a great example of our compactness, eliminating PSG's expected midfield overload. Locatelli, again, moves centrally to help out in midfield. Silva drops back creating 5 vs 4 advantage and a very crowded space. My right back is free to help where necessary. Berardi could be deeper, perhaps illustrates he has decent but not exceptional work-rate. Very Fluid - High Creative Freedom & Movement. Standard mentality allowing players to chose the best option rather than other influences such as being more attacking. Player role distribution creating asymmetrical shape. Play from defence, pass ball into space and low crosses show attacking style. Striker moving into flanks creating gaps. Neves acting as the primary playmaker - multiple options, here he picks Jorge. Notice the difference in the behaviour of the DCs in a back 4 in comparison to 3. Neves, Locatelli, Mauri and Silva form a diamond allowing an easy transition. Berardi keeps opposition defence in position. 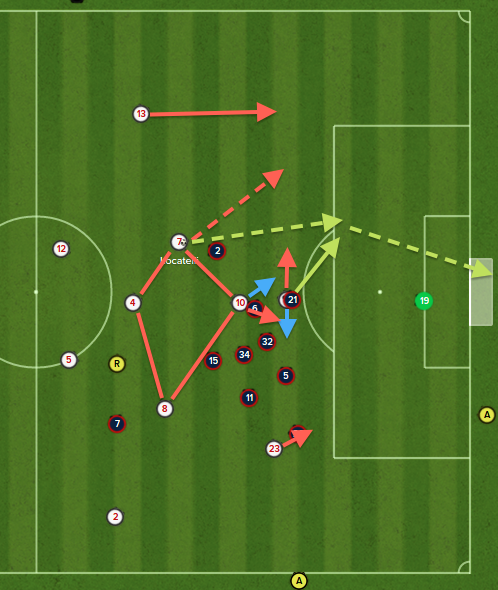 Once the ball passes Silva, he turns and attacks as a second striker. The diamond has formed again. Jorge and Guedes are providing width. Red / Blue run options for Berardi and Silva to create space for Silva to attack. Red dotted arrow is the obvious pass I anticipated Locatelli choosing, playing Jorge in behind to shoot or cross. Green dotted arrow is the actual pass he played, the other greens are Berardi's run and excellent finish. 1-0. 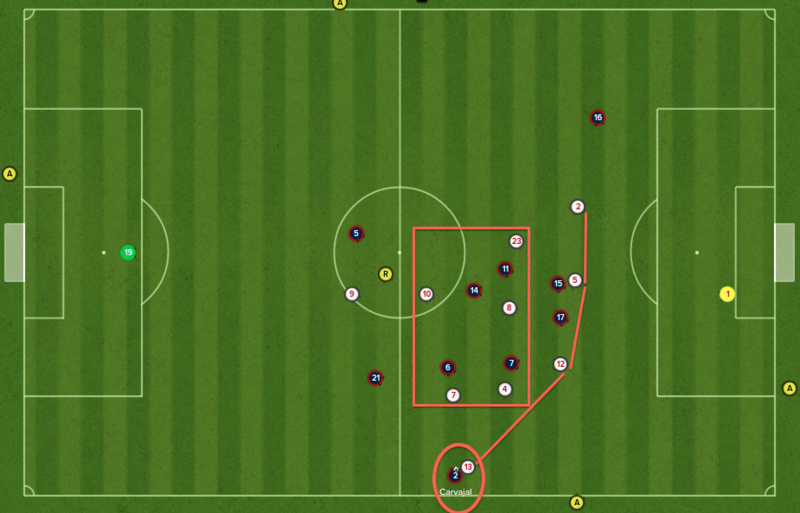 More of a typical 4-4-2 shape - attacking runs mean we do not see a diamond shape in midfield. Silva has joined Berardi as a second striker - if Guedes beats his man, #5 must decide whether to press Guedes or track Silva - either way, one is free. Locatelli is making a dangerous run at the back post and occupying the fullback. Di Sciglio is making a supporting run. Mauri is a little too deep here. Wingback - rather than winger - orchestrating the attack. Due to the combination of roles on the right flank, we actually look more dangerous attacking down the left side. Diamond has previously formed but now you can see Silva transition into his role as second striker. Guedes is much more aggressive attacking the far post, really stretching the defence. Shape is almost a 3-3-4. Comfortable win. Not as emphatic as Ajax but also completely in-control and played some great football. Timo Horn saved PSG's blushes here with a man-of-the-match performance. If you're interested in the development of this squad, once again I have posted updates in the AC Milan thread in the Good Player & Team Guide Forum, although please note this has been a much shorter game. Thank you very much for reading. Hopefully you enjoy it and maybe find it useful. I'm very interested to hear how you get on implementing a playing style of your own! Edited November 8, 2016 by Ö-zil to the Arsenal! Another classic thread from you. Great job. Great Thread Ozil. I will try implement this with my current Arsenal Team. I can see from your player roles that the WM and WiNger does not have any PI to cut inside. i am guessing the AMC ALattack is your secondary goal scorer after the CFS. I plan on using Ozil has the AMC Attack. I just hope is playmaking PPMs do not hinder is performance too much. What are your thoughts on Ozil playing this role as AMC attack. It's actually great to see someone focusing on making the opposition make choices. Myself aside I've never seen anyone write about this side of the game in their posts before (or if I have, I've forgotten). It's great to see all the options you have and forcing the opposition to pick one. In a lot of your examples even when the AI picks an option its nearly always the wrong choice. That's the way of beating any side, you force them to make choices but leave them with a lot of bad choices and not having a good option that the AI to select. It really is brilliant seeing someone else write in this style because it shows that when viewing a game you see the full picture and not just focus on a small snippet. I enjoyed this more than the Ajax thread btw, not because the other isn't good. But you seem to have changed your writing style ever so slightly and now talking about the little things, which imo are the factors that have the biggest impact in anyone's games. Very encouraging for my 442 which I was starting to have doubts about, the only difference is your WM is attack duty where mine is support and I have a WM-A instead of a W-A. "Emre Can, 24 games, rarely gets over 7, typically one of the lowest rated players in the team, 86% pass completion, 25 key passes (1 per game) and zero assists. As the deepest midfielder i'm not expecting lots of assists but I was expecting a few more key passes, Gomez with 500 less minutes of game time has 2 more key passes playing as either DC-D or FB-S."
I suspect this is due to his lack of mental attributes: Decisions, Positioning, Off The Ball etc. Joe Allen typically plays better in rating and what I see. Just shows how important it is to get the right players for the system. Picking a good tactic means to regroup quickly on the field. 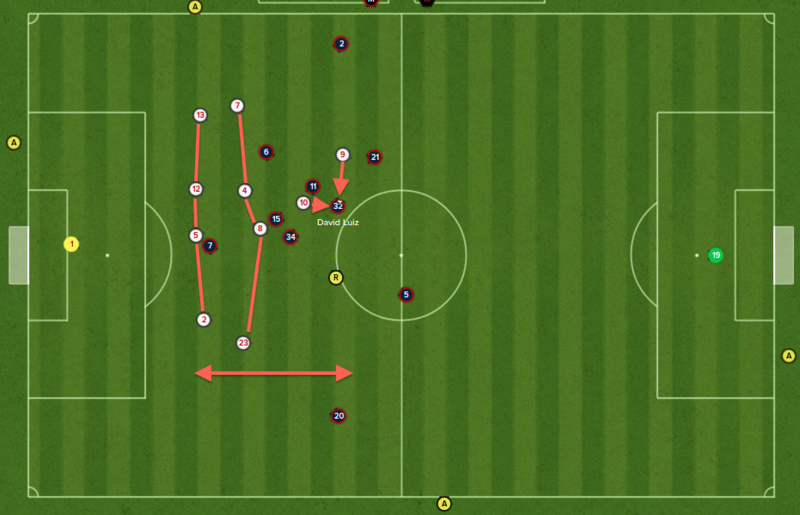 Covering the left and right wing while having the chance for passes towards and from the center. I was very excited when I saw this! I am a huge Sacchi fan and I have been creating Sacchi based tactics (here's the link to a thread I created here back on FM13) and it is fantastic to see other people's visions on how to set this up. 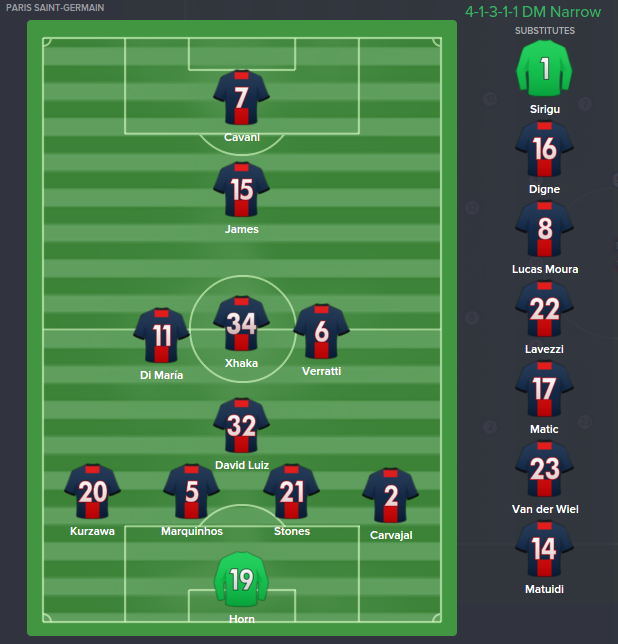 My current tactic is based on Ranieri's 4-4-2 with Leicester and Sacchi is of course one of his biggest influences. In fact, my tactic is more of a hybrid between the two as it is more multi-focused and I play out the back unlike Ranieri's team which is more direct. Besides the tactical side, the most important aspect of Sacchi's way is the philosophy of the 'complete footballer' and player recruitment is crucial, particularly players with the right mental attributes and personality profile. Without this, you can try to play the Sacchi way, but you can forget it if your front two are Ibrahimovic and Balotelli. Great stuff. I've actually been folding the concepts from your Cruyff thread into my own 4-4-2 with promising results. One comment about the phenomenon of the exaggerated effect of mentality in a very fluid system - I find that when I want to become either more attacking or more defensive, I change player duties rather than team mentality. One of my biggest complaints with the ME over time has been the fact that so much of tactical managing in the game seems reactive. Truly successful sides force the opposition to react to them. Nice to see you both writing about how to do that. I love the way you write your threads. The sacchi way for many fm tacticians is the holy grail. So...thank you. Excellent work Ozil. After reading your recent posts in the Milan team thread I tried your tactic last night and it worked superbly so thanks very much. I loved Sacchi's Milan - it really was a special side, & he was a real one off coach, apparently the players used to try and avoid him in the Milanello corridors as he'd stop them and talk football at them for ages, also read somewhere that he'd scream out tactics/instructions in his sleep! Due to the high level of playing style (closing down + tactical positions on & off ball) it was hard to play this way for a whole season fitness wise which is why I guess he won 1 scudetto but they'd 9/10 win the big matches & it just clicked i.e. 5-0 v Madrid @ San Siro. Really like your take on his tactic for FM. Especially how good the defence is. 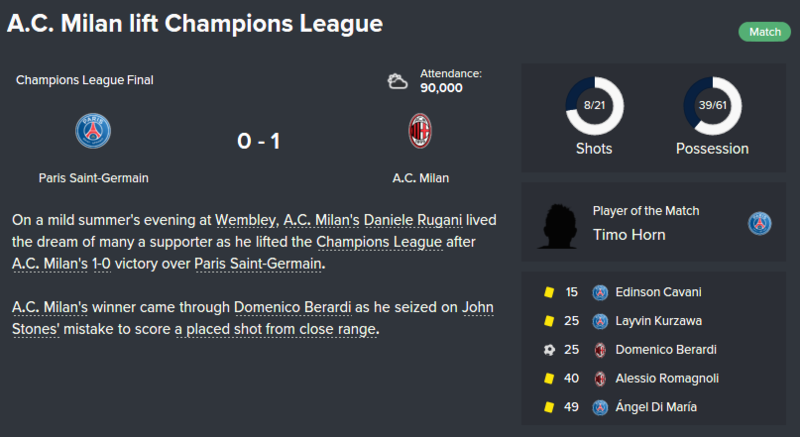 I have been trying to do a Sacchi tactic on FM for ages and failed for ages so thanks again! Those are some pretty insane results. 30 clean sheets in 38 games, playing with the highest possible dline (including highest possible closing down). You do have 2 of the finest DC's of their generation in Italy, but still i am not sure i have seen such astonishing figures. How many did you score in total, and what was the spread like across the team? I think that is an interesting thing to look at, when you compare to the Sacchi Milan side. The one aspect of Sacchi's approach which i dont think you can easily re-create are the different types of pressing he used throughout games. Your approach must produce a huge amounts of high intensity pressing, which is clearly mega effective! Sacchi' would mix his pressing through the game, including false pressing, where they did not really press at all (i would think "take a breather" TI for parts of games would be closest you can get). Last question i am really interested in about your season here, is maybe not strictly tactical. One of the things i am finding more and more is that the ability to manage a squad is almost as important as tactics. You will get injuries, suspensions, slumps in form, slumps in morale. How did you manage these so effectively as to do an unbeaten season? I guess part of the answer is having a great squad, and the effort that goes into building, but i think that the unbeaten season is such an achievement - be great to hear any ways in which you managed those squad type issues. 1. Could you add some details about training and developing your players to fit the system? 2. Which PPMs do you prefer to use and which can ruin everything? 3. How do you adapt your tactic to different opponents (TI/PI/OI/etc)? 4. What do you think regarding position/role change (e.g. AMa to CMa and/or moving DLPd from CM strata to DM) to provide more defensive stability without losing emphasis on attack? 5. 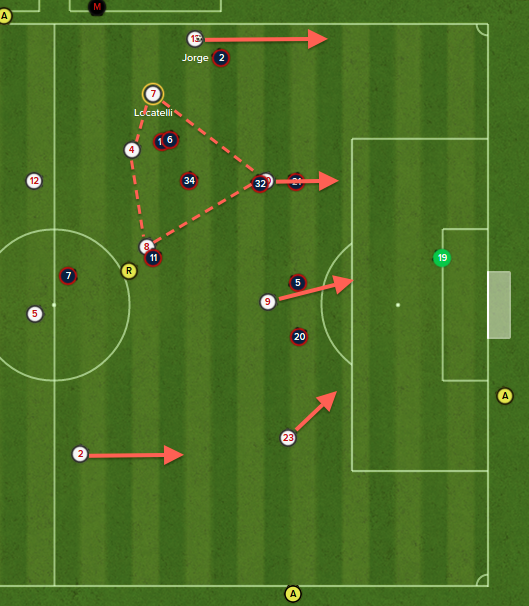 Do you bring another playmaker role into the game instead of DLP to shift the focus on building up your attacks? There's a lot of similarities between this and my current set up as posted in the debate in the Gegenpressing thread. Ozil would be prefect for the attacking midfield role - he's one of the best technical players on the game, very intelligent and good work-rate for an attacking midfielder (work rate = 14, determination & stamina = 15). You've also got Sanchez who is perfect for either a wide or a central role. Ramsey is a very complete central midfielder. I'd probably focus on signing a centre back and a holding midfielder. This thread was easier to write because the formation is simpler. With the 3-4-3 it took a lot of time to illustrate how 3-6-1 becomes 3-4-3 in the match engine, whereas in this case it's pretty easy to see how a 4-4-1-1 becomes a 4-4-2 so theres more time to talk about the details. Don't worry about average ratings - the whole team bumps up when you score 2-3 goals so that's the easiest way. I certainly don't like the clear cut chance calculation and I am not convinced by the key passes. Your holding midfielder should be the most intelligent player you can get with the caveat of good positioning (in comparison to more advanced players). I see no reason why Can wouldn't work but you could possibly find better. That's one of the points I am trying to make - glad it came across! Switching mentality works well if you're 1-0 up in the dying moments away to a better team or chasing a goal but for an overall strategy in combination with very fluid, smaller tweaks are more effective. We scored 85 in Seria A - 2.25 per game. One of the pleasant surprises about this team was the consistency. We won a huge number of games 2-0 or 3-0. The defence was an absolute rock - they're some of the best players on the game and most played together consistently for 3 years, shielded not just by a holding midfielder but the entire team helping press. I am a bit pushed for time right now but later today I will write an answer for you on squad building. I will also give an answer to these questions later today. Yeah I wasn't happy with him when I watch the game footage, he just didn't seem to do much, so I started looking at the ratings and analytic's I think its the combination of attributes and PPM. At the start he has Positioning 10, Off The Ball 11 and Decisions 12 (I think) but great physical attributes, Allen who I think has about 14 in those attributes, I can see him getting in better positions to pass from or intercept balls. Can has "Avoid using Weaker Foot" even though his weaker foot is very good, I think this limits his options without amazing technique to just use his strong foot for everything. I'm going to keep developing him but i'm thinking of bringing in a new starter, someone a bit older who can play for a few seasons. Great piece again, just one small query. I don't think Sacchi's team played possession football per se, could you please explain why you've used the TI play out of defense? Read your 3-4-3 article on the move the other week and forgot to comment, but this post is another fantastic bit of work. Awesome stuff! Hi ozil another excellent threat. I just want to check. Is this fm15 or 16? I would argue they were more narrow. Looking forward to this thread taking off though. OK - coming back to your question on squad management..
You're correct - squad management is absolutely crucial. Firstly you have to build a squad - either by signing players or developing them yourself. I tend to have busy transfer windows in the first two seasons, and then give lots and lots of game time to my preferred players. Once you've got your team sorted, you need to decide how to manage the rest of your squad. You can play a smaller squad and micromanage or a larger squad and rotate. In this instance, I used a very small squad. 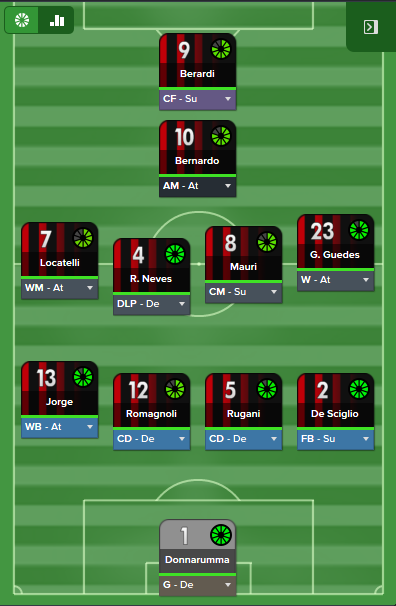 The starting eleven detailed above is my starting team for every Serie A and League game they're fit. A lot of that team made 40+ appearances between the two competitions. Ajer covers my central defence and midfield spots so also recorded a lot of appearances. Luis Henrique covers my attack. Calabria & Sansone cover the right flank. Bonaventura & Antonelli cover the left. Outside of this I think I have two older tutors and that's it. I can muster together a Cup side including players from the youth team to avoid burnout but that's it. This works well in circumstances where there is a gulf in ability between your starting 11 and the rest of the squad, which typically comes down to budget constraints. You do need to have some luck with injuries. I have cover in every position, but a crisis can end your season. For example, I was done if Silva got injured long-term. You do get an advantage in that your team become totally used to playing together and - when things are going well - cohesion and morale are high. In order to make this work, I use low / medium team training and 2 days rest (pre- & post-match) combined with individual routines and team focus on teamwork. Most of the time my first team condition is ~90-95%. Higher in weeks with one game and at the lower after say 2 games per week for 2-3 weeks. At Ajax, I used a different approach for two reasons. Firstly, I always had a bunch of youngsters who need game time and secondly the league is much easier. Typically my first 11 would play 20-25 league games plus every competitive (i.e. excluding group games, when already through) Champions League match. In this case my team stayed at 99% fitness and I gave game time to loads of youngsters. We could also train harder. At Milan, my academy produced 3 years of absolute junk - the best player with 3 star potential - so this wasn't an option. I didn't have the budget to buy a whole second 11. This is certainly a challenge in the Premier League - a very competitive league with no winter break. Personally I'd go a smaller squad plus a few youngsters in most cases. Thanks again for the comments everybody! 1. Low / medium team training on team cohesion (because I have a small squad), specialist individual training (see Ajax thread) and teamwork matchday training. 2. I like plays One-Twos and Simple Passes. I also like Stays Back at All Times for my holding midfielder and Gets into Opposition area for attackers. 3. Generally start the with the same formation. Occasionally tweak based on a glaring weakness such as playing wider but in general the team automatically decide to attack the weaknesses. If I need a goal, I'll go attacking. If I need to hold a lead, I'll go defensive (reasonably rare) or play shorter passing and retain possession to keep the ball. 4. For me, I value bands of players eg. ML - MC - MC - MR so I avoid placing players in the DM strata but it can certainly work. My AM is an AM so he acts as a second striker when we attack. 5. I would be more likely to remove the playmaker role than add a second. This would make the team completely free to pick any pass they want. Playing a second playmaker would encourage them to search out either playmaker. Ah yes, I agree. Those attributes are not good enough for a club like Liverpool. I'd sell and develop a youngster or hit the transfer market. Personal preference. Play from Defence doesn't necessarily imply possession football, it simply means your defenders will pass the ball into midfield rather than the temptation to go long. Berardi isn't a good option for a long pass. Thank you very much. That's a fair comment. You could easily add a team instruction to play narrower with out causing any issues. It's a very customizable system. First off, that video sent me on a nostalgia trip like I've never experienced since I moved to America Secondly the thing I was most impressed about was how compact your team was. That's been my biggest issue right now. may you describe your approach in developing players from their coming to squad selection? For example which value of the main attributes do you require towards achieving 17,18,19,20 years? Could you highlight the most important traits (and their weights also) by every position/role? However your description of the complete footballer in Croyff Thread and this one slightly differs in couple of attributes like Teamwork and Composure. In this case, I had 3 terrible youth intakes so did was not operating a full academy. I could have scouted more but it was a long, up-hill struggle without bringing players through ourselves. Instead, I focused on the first time success intending to later improve the youth academy. See the second post of the Ajax thread - I talk about youth development in far more detail there. How's this working out for you now? PS I was a huge fan of your original Sacchi thread. You said that you change mentality when you loosing or winning...I would like to know if there s a moment to do that(cause im really struggle)....and if you tweak roles for that. No. There is no specific moment, other than when I judge that I need to defend or attack more. And, no there are no role changes. Changing mentality with a Very Fluid system is a pretty extreme move. This is because each players mentality is more closely linked to the team mentality, than their own role/duty. So, if you go attacking, the entire team goes attacking. Likewise with defending. I don't do it much but occasionally it can be effective. Going to start an Arsenal save using this formation. I have a long term game with Barca where I have micro managing and controlling the youth team as well to ensure a steady stream of La Masia graduates for the first team. The Arsenal game will be different in that I am actually going to use the create a club feature to replace certain players and put less emphasis on developing youngsters. Chambers can cover RB and CB, Laporte CB and LB, Alex Sandro LB and LM, Verratti DLP, Koke RM and CM, Gaitan / Bernardo Silva AMC and LM, Dybala AMC and ST. Any feedback would be greatly appreciated. Yes, Busquets is pretty perfect. I also rate Verrati very highly. Asser Illaramendi and Eric Dier are both also very good. Cabaye and Yacob are more budget friendly options. There are a couple of good options if you're happy to allow the first season to develop - Neves, Maia, Bazoer, Ajer. The rest of your team looks great - I find Ox, Wilshere and Ramsey to be very well-rounded, complete players but they aren't world beaters. Ozil and Sanchez are absolutely world beaters and often win the league by themselves in the first season. Neves and Maia are both in my Barca squad, two quality options. Yes I am a huge fan of Jorge actually, so is usually my go to option on saves and I have never managed Alaba so thats why I chose him ha. I think Ozil and Sanchez should run riot. I might even stagger them, Ozil right of centre and Sanchez left of centre. Suarez excelled for me as a CF support and Sanchez is a similar type player. Have actually always wanted to pair them up front in a Chile type 3-4-1-2 formation with them both as sort of complete wide forwards and someone like Ozil in the hole behind them but thats for another day. All the feedback is appreciated. Wonderful thread also by the way as well as the 3-4-3 diamond thread. Used something similar with Barca only with wing backs rather than wingers. EDIT: One other thing, regarding the LM playing as a wide midfielder. Have you only used left footed players there? if not, do you notice any difference in a right footer playing there ie cutting in more. Will definitely be trying this new one with my Cardiff team as they are more suited to 4-4-2 (or 4-4-1-1) than playing 3 at the back as in the Cruyff tactic Ozil discussed elsewhere. Great start using this tactic; much more control than when using the Cruyff one as it suits us better. Derby and Burnley were in and around the playoffs and have good teams. Bolton down in 20th but they caused us a few problems with their Christmas Tree formation. Yes, it's early days but some of the football we are playing looks superb. 623 passes v Burnley, with over 80% completion, and 64% possession. This is truly a remarkable thread. Great read! Plan on giving this a go with my Blackpool side. Ah, you've actually spotted a mistake - thank you very much. In a 4-4-2, I actually just ask my goalkeeper to distribute quickly. He has the option of any defender or, often, midfielder. In the 3-4-3 distribute to playmaker. Distribute to playmaker makes your playmaker drop deep for the ball (may be combined with a PI but certainly Bazoer does). 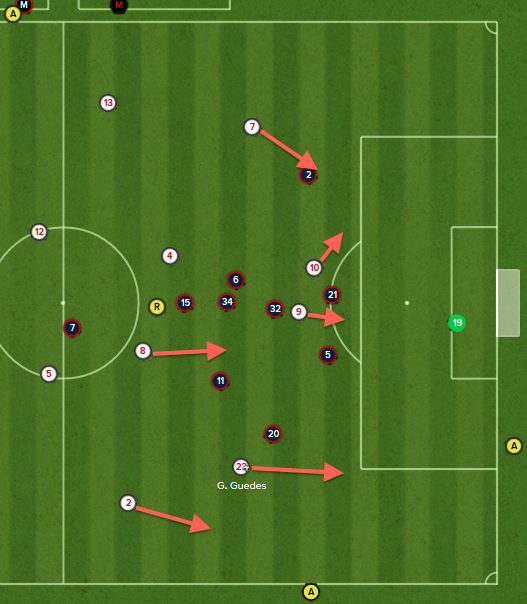 It works well because it overloads the opposition players pressing and creates the diamond at the back I talked about. The playmaker then follows the ball forwards as play develops, stopping once he reaches the centre circle then controlling that position. Whilst this style of player works well at the elite level where you have the players with the right mentalities and skill level, is there any way to use a similar style of play with lesser players? I was thinking perhaps dropping the shape to Fluid may help to ease lesser players into the style, with the plan being to gradually develop the style as the club progressed? Would this be a realistic option, or would it fundamentally change the style of play? The main problem is that lesser defenders are not suited to supporting the attacking phase, and strikers are not all capable of support the defensive phase. My thinking would be that Fluid would remove this expectation of players not suited, although I can imagine it would increase the burden on the support players. You're right. Lesser defenders are unlikely to be as good with the ball at their feet and strikers may struggle being responsible for leading the defence. That's not to say it could never work, but you'd likely have to develop players yourself and would probably to reduce pressing according to fitness levels. Who do you sacrifice when going down to ten men? That's a very random question! Depends entirely on the scenario. First congrats on the thread, very well written. 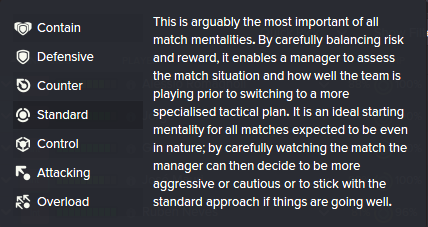 I just wanted to ask if one could take this principles and apply them in FM 2015. I know that it takes a certain type of players, has you have pointed out. But in terns of tactics principles, do you think it could work? Im still playing around whit fm 2015. 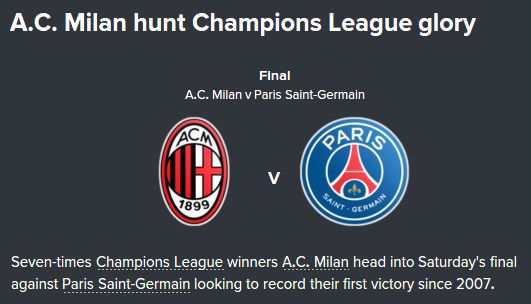 I just had that situation in the second leg of the Cap One Cup semifinal. I was up 1-0 in the 80th minute when one of my central defenders got sent off. I took off my CF, left the AM on attack, switched other attacking players to support and both fullbacks to defend and set mentality to counter. Managed to hang on. Ozil, how do you build up your first XI? What attributes in addition to main DNA do you prefer for each role? Moreover if you take a weaker side like Palermo/A'Villa/Boavista lacking complete players how will you amend this tactic considering you can't buy any players? Just curious about the movement of a few players... what PPMs does Locatelli have? His movement seems interesting and from what I can see earlier in the thread you didn't give him any PIs. I also really like Bernardo's movement. I would have thought he would rush into the box at every opportunity but seems to vary his movement quite a bit - do you think this is because of the Very Fluid shape and the Standard mentality or does he have Come Deep To Get Ball PPM? Squad building is huge. Most of the time I manage bigger clubs but even then I will need to make 5-6 changes to the starting line up. In these circumstances I allow 3 years to reach top performance. Using Milan as an example, I started with Donarumma, De Sciglio, Romagnoli, Mauri and Locatelli and brought in Jorge, Rugani, Ruben Neves, Guedes, Bernardo Silva and Berardi. My transfer strategy is always aggressive and early in the game. I brought Rugani in the first transfer window and spent most of my budget. In the second summer, I cleared a lot of dead wood and brought in Jorge, Ruben Neves, Bernardo Silva and Berardi once again spending my entire budget. I then give this team a season to get used to playing together where we won the Scudetto before signing Guedes as the "cherry on the cake" giving us a very complete squad. Guedes was a like for like swap with Sansone so didn't require any tactical changes, he was simply an upgrade. Mauri and Locatelli were both very young at the start so I get them tutored and give some game time during first season. Lots of game time in the second season. By the 3rd they're ready to kick on. At Ajax - many of the players I used were at the club, but mainly in the academy so there was lots of this type of development. 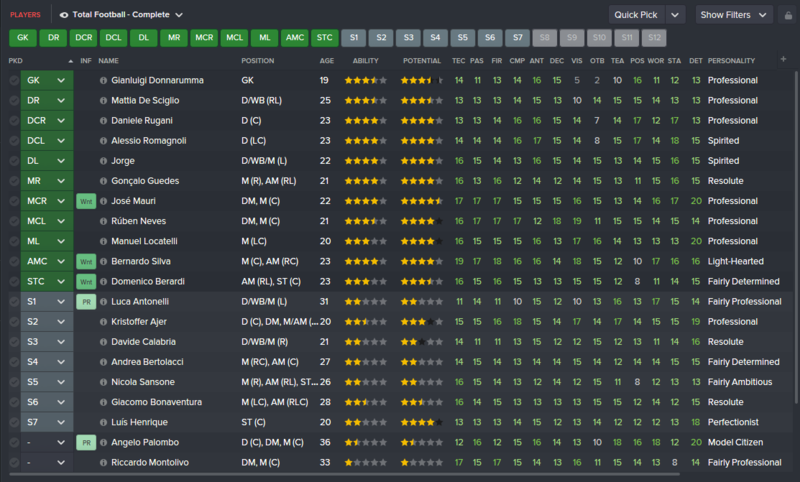 In general, I monitor my player development by setting up a filter in the squad screen. I use the same attributes in player searches, modified slightly for various positional requirements and build the squad from there. My general approach is to be aggressive early in the transfer window - use Bayern as an example, get your business done early/quickly and don't be afraid to splash the cash when you find the right person - and to give plenty of opportunity to youngsters. If i took a weaker side, I'd start with a different tactic that is appropriate to their players and build towards the style I wish to play. Locatelli has no movement PIs. I trained him to play one-twos and simple passes. Attacking Midfield (Attack) is one of my favourite roles. Nobody uses it because everyone wants a Trequartista or Playmaker or Enganche but I love the movement. It's a very versatile role as you can have the player move forward & back or left to right or even hold position. It's very useful. When the ball is in transition the AM acts more like a midfielder, and when the ball enters the attacking 3rd he's a second striker.